The Legion of Christ Catholic order has for the first time apologised to the victims of sexual abuse carried out by its founder, Father Marcial Maciel. In a statement, the order condemned the "reprehensible and objectively immoral behaviour" of the Mexico-born priest. Father Maciel led the order from its foundation in 1941 until 2006, when Pope Benedict ordered him to retire. 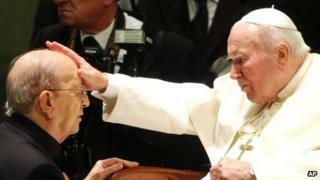 He abused seminarians as young as 12, and died in 2008 aged 87 without ever being convicted of his crimes. A Vatican investigation also found out that he had fathered several children by at least two women, and used drugs. "We want to express our deep sorrow for the abuse of minor seminarians, the immoral acts with men and women who were adults, the arbitrary use of his authority and of material goods," said the Legion of Christ in a statement. The Roman Catholic order apologised for not believing in the beginning in the testimonies of the victims and later, for the its "institutional silence". "We regret that many victims and people affect had to wait in vain for an apology from Father Maciel," reads the statement. "That is what we want to offer today, expressing our solidarity to all the victims." Father Maciel was disciplined by the Vatican in 2006. Pope Benedict ordered him to stop exercising his ministry in public and to retire to a life of prayer and penitence. Father Maciel, who was close to the late Pope John Paul II, always denied all the allegations. The order has said in its statement that its essential features "do not originate in the person of the founder". The public apology was announced as the order chose its first leader since the scandal forced Father Maciel to leave. The new leader is Father Eduardo Robles Gil, from Mexico. Since 2010 the order had been run by the Vatican, who will continue to keep a close eye on its activities. Two Vatican advisers have been appointed to serve as governors in the Legion of Christ. The order has a conservative profile that attracted donations from many wealthy Catholics, particularly in Mexico. It operates in more than 20 countries and has nearly 1,000 priests, running schools and charitable institutions across the world and a Catholic university in Rome.